Delighted Armagh manager Peter McDonnell said his team's "manliness" had been the key to Sunday's Ulster Final replay win over Fermanagh. Armagh had been criticised last weekend for not winning enough "dirty ball". "When you are talking about break ball, you question manlihood," said the Armagh boss after the 1-11 to 0-8 win. "Ciaran McKeever, Martin O'Rourke and Aidan O'Rourke are not the sort of fellows that take kindly to that sort of criticism." McDonnell added that the county's seventh Ulster triumph in 10 years had come as "the era of Armagh football success was supposed to be behind us". "Those lads refused to accept that. The young fellows that have come in have proved to be mighty men. "I'm just so happy for all of those players, for all the hard work from last October. "It hasn't been easy but they kept at it. "We could have thrown in the towel after last week's performance in the last 20 minutes but the fellows looked at themselves in an honest way." 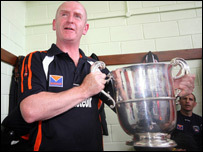 Armagh captain Paul McGrane described the manager as "Peter the great" after he accepted the Anglo Celt Cup from Ulster Council president Tom Daly. Typically, McDonnell preferred to let his players take the credit and he was also careful to pay tribute to the beaten Fermanagh outfit. "This is not about taking any delight in beating Fermanagh. "They are a credit to football. They have brought football to a new level of organisation." "Bitterly disappointed" Fermanagh manager Malachy O'Rourke agreed that his team's missed chances had been crucial. "We could have been ahead at half-time but it was even," said a rueful O'Rourke. "Then in the second half, we lost the ball in the tackle (too much) and Armagh got the chances and put them away. "We have no complaints. None of the boys went out to hit wides. "They worked very hard between the two games on frees and it's frustrating but nobody meant to miss them." O'Rourke acknowledged that losing Barry Owens shortly after his second-half introduction had been a "jolt". "Barry had started well and was causing a bit of trouble in there and it was just unfortunate. "I'm not sure the exact extent of the injury but it seems fairly bad."